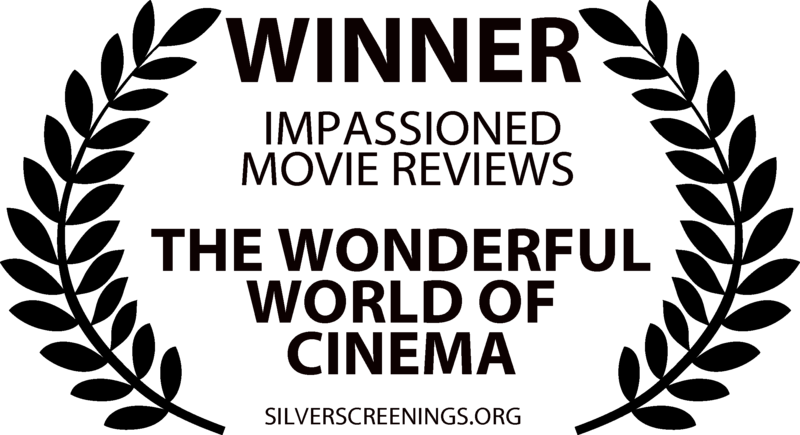 I was saying to myself that I hadn’t written a movie review on my blog for a long time. I mean, a movie review that is not due for a blogathon. The other day, I was watching The Birds and it was probably my 20th viewing (kind of). So, I felt inspired to write a review. As a matter of fact, I will not only write a critic but will also, as much as I can remember, tell you how was my initial experience with this film when I first saw it or how it introduced me to the fantastic and mysterious world of Alfred Hitchcock films. Because yes, The Birds is the first Hitchcock’s film I saw (I have a feeling I’ve told you this before…)! Alfred Hitchcock directed The Birds in 1963. 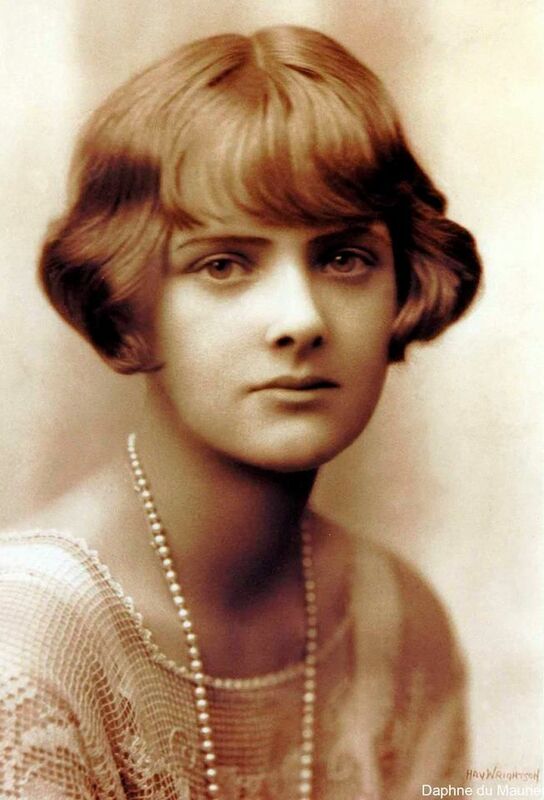 The movie was based on a story by Daphné Du Maurier. It was his third and last film based on a literary work written by this author. Jamaica Inn (1939) and Rebecca (1940) were the first ones. 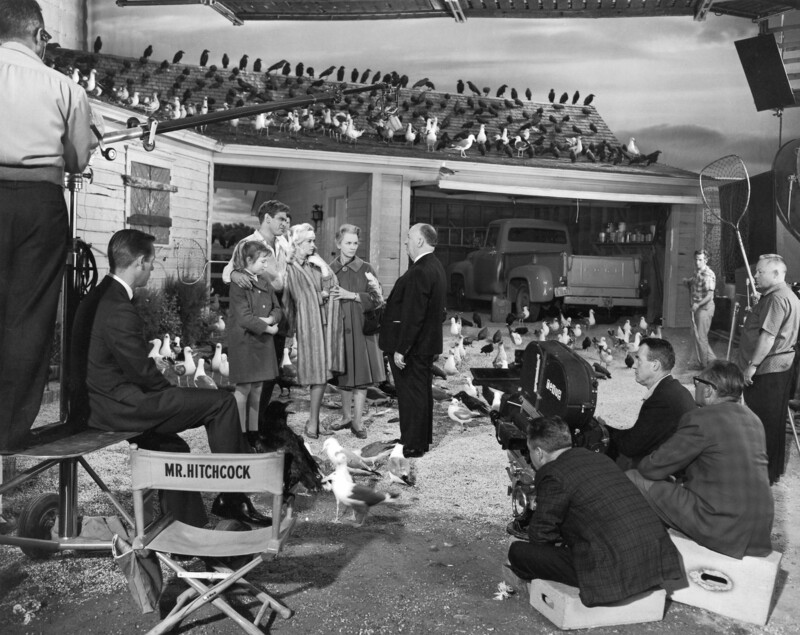 It was also the first of two Hitchcock’s films starring Tippi Hedren. The other one was 1964’s Marnie. The film also stars Rod Taylor, Jessica Tandy, Suzanne Pleshette and Veronica Cartwright. The Birds takes place in California. It begins in the beautiful city of San Francisco, but the main story is set in the fisherman’s village of Bodega Bay. Melanie Daniels (Tippi Hedren) meets the lawyer Mitch Brenner (Rod Taylor) in a pet shop. He remembers having seen her in her process for a ridiculous case, but she doesn’t remember him. She then is the victim of a practical joke and learns that he is there to buy lovebirds for her sister’s birthday. When he’s gone, Melanie, to prove him that she’s not who he thinks she is, decides to buy the lovebirds herself for Mitch’s sister. She finds out what his address is, but when she arrives at Mitch’s apartment, a neighbour informs her that he is gone to his house in Bodega Bay. So, Melanie goes there. Here, she meets the schoolteacher Annie Hayworth (Suzanne Pleshette) who informs her that Mitch’s sister is named Cathy (Veronica Cartwright). She goes to the Brenner’s by boat and enters in the house incognito. She puts the birds on a table with a letter for Cathy. She has the intention to leave one for Mitch, telling him his Four Truths, but abandons the idea. Then, Melanie leaves and Mitch comes back to his house. He goes out immediately. We guess that he has seen the lovebirds. He takes a pair of binoculars to see who is in the motorboat and, with amusement, he recognizes Melanie. He then decides to go meet her. When Melanie arrives at the port, Mitch is waiting for her, but, suddenly, a gull attacks her. It’s with fear that she discovers that she is bleeding. Mitch goes down to help her and takes her to a coffee shop to cure her injury. There, Melanie meets Lydia (Jessica Tandy), Mitch’s mother. This one is kind of cold with Melanie and doesn’t seem to appreciate her. On the other hand, her daughter Cathy appreciates Melanie very much. This won’t be the only birds’ attack. All along the film, they will get bigger and become more frequent. Why are the birds acting this way? We’ll also discover how the relation between Melanie and Mitch will evolve, as well as the relation between Melanie and Lydia. With such a plot, The Birds may sound like a B-Picture. It could have been one, but it’s not. Why? Because it is a film of quality, with a care for good special effects (they were brilliant in 1963 and still are not so bad). 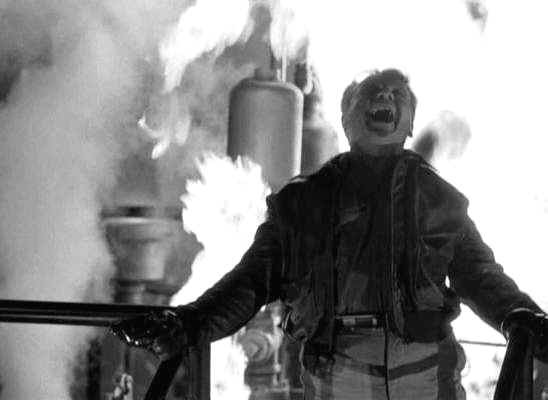 The film was nominated for Best Special Effects at the 1964’s Oscars. It also was a long production. We know that B-movies are poor quality films and are normally shot in a short amount of time. We also have to emphasize the great work of George Tomasini who edited the film. I always thought that it was one of the most well-edited Hitchcock’s films, especially for the attic’s scene. This scene is impressive and scary, but this is due to the magic of a brilliant editing. However, shooting this scene wasn’t without danger. You probably know what happened to Tippi Hedren. She was told that this would be made with mechanical birds, but the day they were shooting the scene, she learnt that they never had the intention to shoot the film with mechanical birds, but with real birds. Well, I’ve heard another version saying that the mechanical birds were not working this day. The scene took five days to shoot. 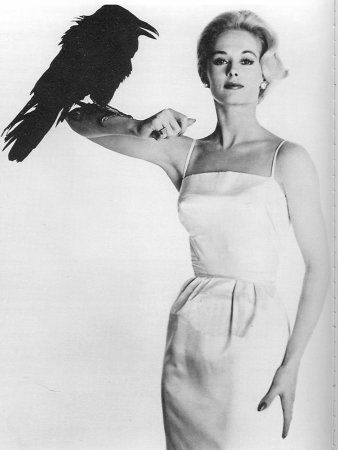 Of course, the birds weren’t really attacking Tippi Hedren, but it seems like they were because of the editing. 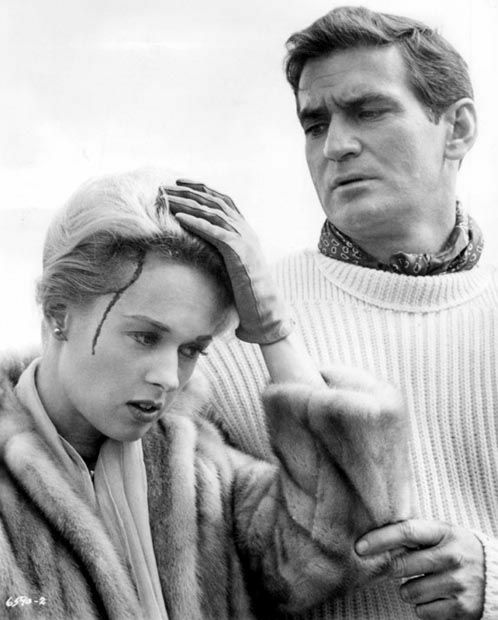 However, when they were shooting the scene, a gull cut Tippi’s face with its beak and almost put out her eye. That was too much for the poor Tippi who shot “That’s enough!” when this unfortunate thing happened. She then had to rest for five days under the doctor’s orders. What’s also very special about The Birds is the soundtrack. As a matter of fact, there is no music. The birds, with their screams, create the ambiance. The only “music” we hear is the song sang by the children during the school scene and the piano played by Melanie. The sound effects were led by the compositor Bernard Hermann. It was one of his last collaborations with the Master of Suspense. There’s a scene in this film where the birds attack the Brenner’s house. Here, the sound dimension becomes very important. I’ll explain why: just before the birds come back to attack, Mitch Brenner covers all the windows of the house with large wooden planks. All the doors and the curtains are closed to be as much as possible protected from the birds. Then, Melanie, Mitch, Lydia, and Cathy are waiting in the living room with anxiety for the birds to come, but they can’t see what’s happening outside! So, when the birds begin to attack the house, the four characters and us don’t see them, but only hear them. That’s an interesting scene because it makes us understand how the sound is important in a film and how it can be as much frightening as a moving image. Indeed, during this scene, only the sound itself, helps us imagine that the house is completely covered with birds. Except for the sound dimension, what’s also interesting with this scene is the fact that the house becomes like a large cage, but, this time, the humans are in the cage, not the birds. They are the prisoners that can’t escape, the victims. It’s a role reversal. The same metaphor is also used in the scene when the birds attack the coffee shop: Melanie goes in a phone cabin to be protected from the birds and this place also becomes a human cage. That’s what Hitchcock explained to François Truffaut in Hitchcock/Truffaut. 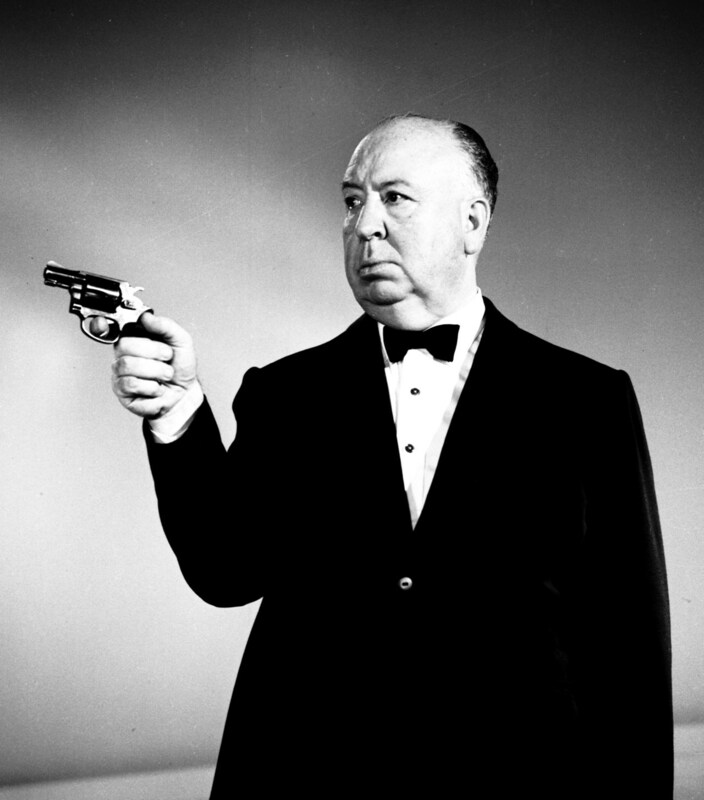 Alfred Hitchcock didn’t want a big star for the leading role. 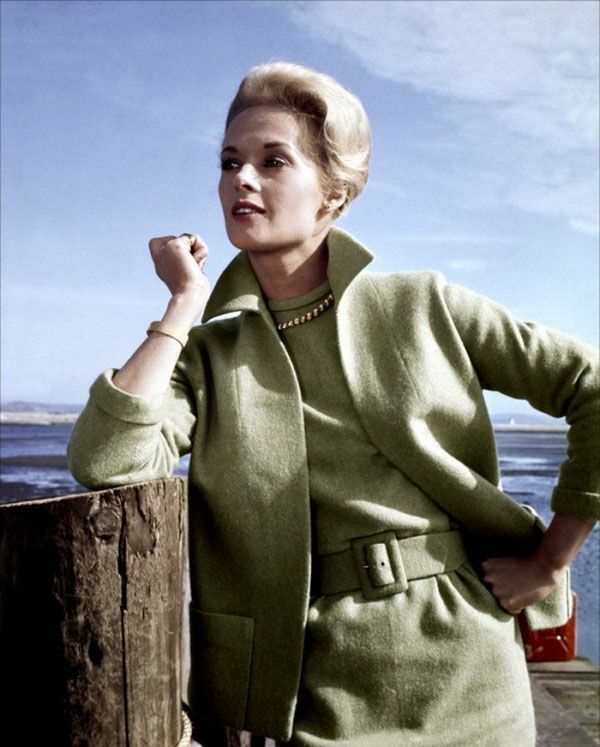 Pamela Tiffin and Sandra Dee were on the list, but Hitchcock then noticed Tippi Hedren in a television commercial and wanted her for the part. I read on IMDB that Hitchcock originally wanted Farley Granger (Rope, Strangers on a Train) for the part of Mitch, but, due to Granger’s unavailability, he had to go with Rod Taylor. 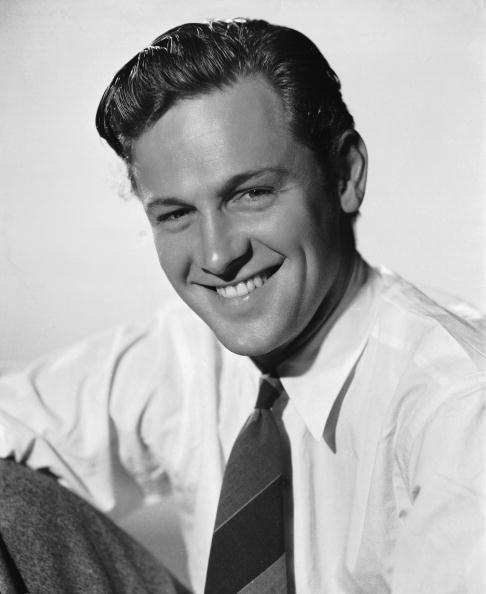 Today, this actor remains well-known for his work in The Birds, The Time Machine (1960) and Giant (1956). 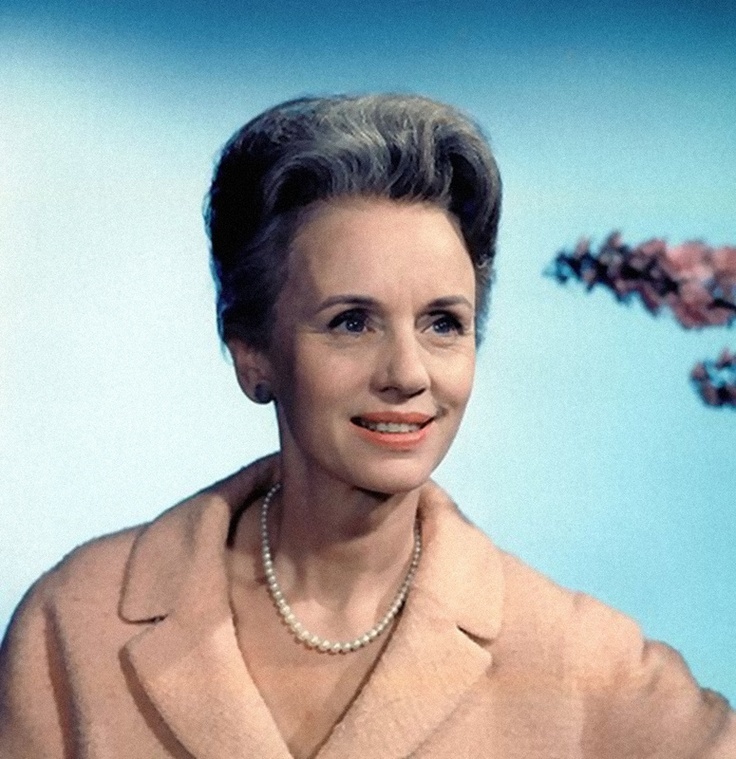 Jessica Tandy who plays the part of Lydia was better known as a stage actress. Years after The Birds, she received an Oscar for her memorable performance in Driving Miss Daisy. 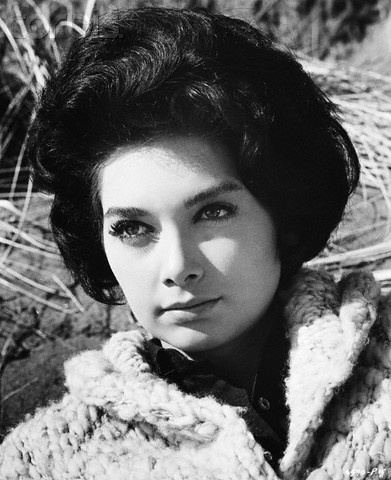 For Suzanne Pleshette, The Birds was one of her first motion pictures. 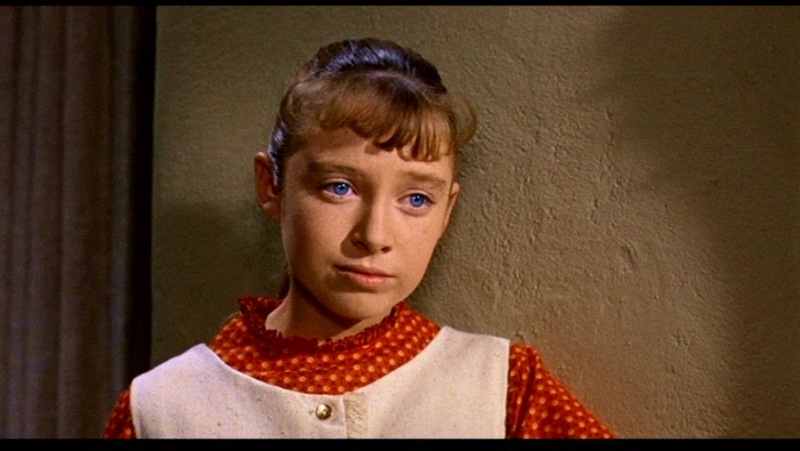 Her collaboration with Hitchcock didn’t go so well as she was a method actress, and we know that Hitchcock was not very fond of method actors… Finally, Veronica Cartwright who starred as the little Cathy was first noticed in William Wyler’s The Children’s Hours, but, in The Birds, she has a bigger part. In my opinion, all the actors did a fantastic job. Their acting is well-balanced and convincing. 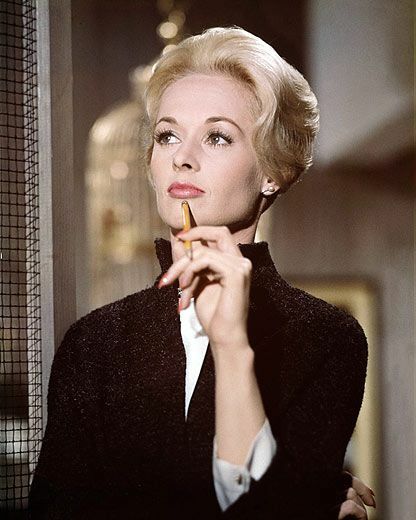 I also have to say that, for a long time Tippi Hedren was among my 10 most favourite actresses. She is not anymore, but she still is a favourite. She has always been an inspiration. 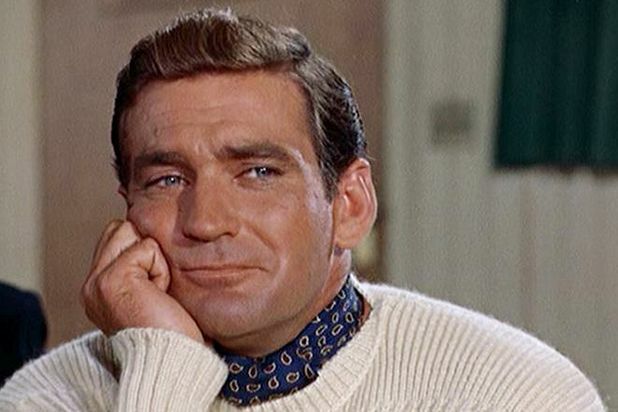 I’m glad they cast Rod Taylor as Mitch because it was a good way to make us discover this great actor. He had a unique charm that I love. Hollywood best costume designer, Edith Head, designed Mrs. Hedren’s costumes. Edith was well-known for her beautiful work on eight Hitchcock films. 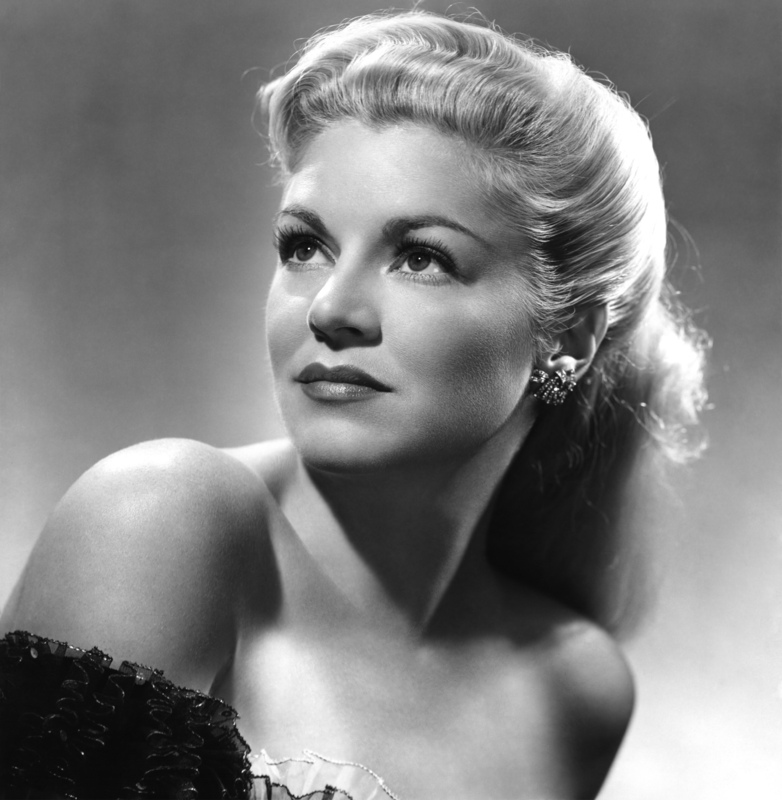 Her most notorious ones were probably Grace Kelly’s costumes in Rear Window and To Catch a Thief. 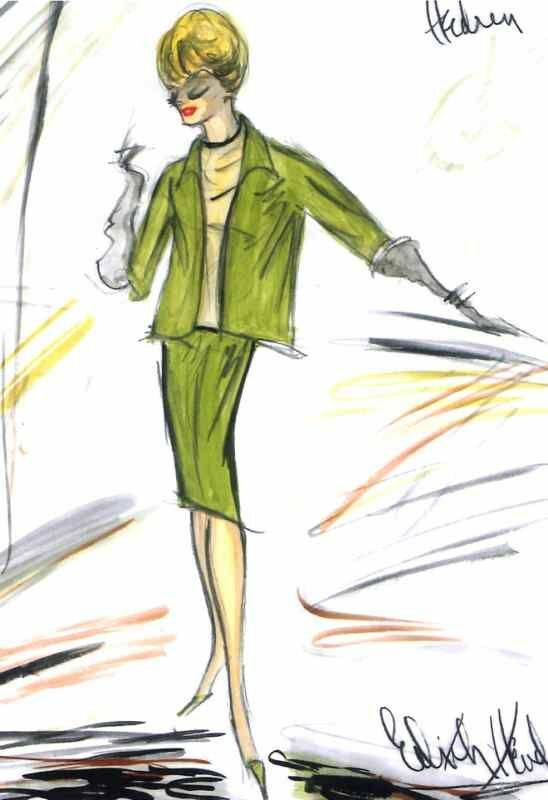 Melanie Daniel’s costumes in the birds were more simple. In fact, we remember this film for her famous green suit. This one is yes, simple, but also very chic and very classy. No extravagances were necessary for that kind of movie. I’ve always liked it. 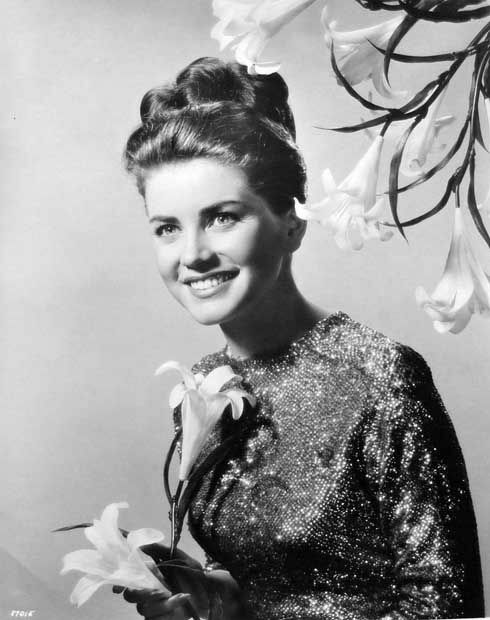 It remains me of Grace Kelly’s green suit in Rear Window. I’ve already told you how I came to watch The Birds in my article Why Do I Love Classic Films. It was my father who first talked to me about this film. According to him, it was a worth watching one, and it was! I shall never forget the first time I watched my first Hitchcock’s film. The suspense was intense and I was wondering what would happen with the birds but also to the human characters. Hitchcock indeed explained to François Truffaut in Hitchcock/Truffaut that he made the film in a way spectators could never guess what was going to happen from scene to scene. That was successful. It’s also one of the films that made me discover classic films in general. I watched it twice the same weekend! Anyway, I simply thought it was a fascinating movie, entertaining, but brilliant too. I must admit that I’m afraid of pigeons, but that started before The Birds. Plus, there aren’t many pigeons in this film. Of course, watching it didn’t help, but I love it so much to stop. As a matter of fact, I always thought that it was very creative to use birds as a monster. Talking about creativity, I’ll invite you to watch this very nice trailer made for The Birds. Only Hitchcock was making such trailers! Today, I consider The Birds to be my 10th most favourite Hitchcock’s film. Even if it’s not my first favourite, I think it’s a movie everybody should see. Not only because it’s iconic, but also because there are both very interesting narrative and technical aspects. That surely wasn’t my last Hitchcock’s film review! And dear, be careful with those birds! 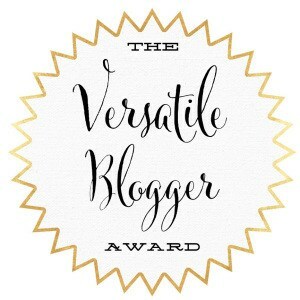 Reblogged this on Welcome to Blog Bella Luna : Posts by you, and for you from Sherry Carroll. Very nice post on one of my favorite movies. If you catch it again, watch Jessica Tandy making the telephone call, it is a simple scene, but so authentic! 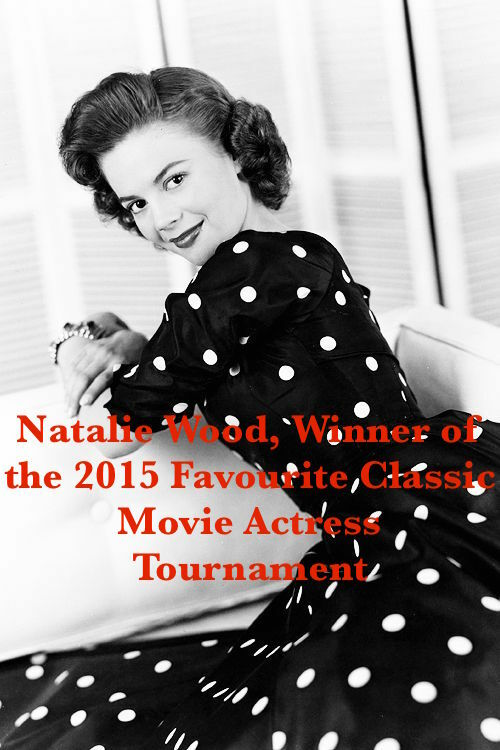 She was such an amazing actress! I met Tippi Hedren a few years back through some volunteer work with The Cheetah Conservation Fund, she is very nice and still gorgeous! Wow that’s so nice! And yes, I remember the phone call scene. Jessica Tandy is a great actress indeed. Nice review! The Birds is a wonderful film. One of my strangest memories of this film comes from the first time I saw it in a theater. They were doing a classic film series at one of our local multiplexes and when The Birds hit the schedule my wife and I just had to go. Seated in front of us that night was a group of high school kids. They did fine through the whole movie, but when we got to the ending…well, that’s another story. We all know the ending… the characters slowly walk out to the car as all the birds just stand there and the film ends. The kid sitting in front of me then blurts out “THAT’S IT! !” Some people just don’t get it, I guess.